And because I know this about myself, I take a lot of steps every day to ensure that I don’t fail at life. Sometimes I still fail. Ha. As you may already know, I still live with my parents. And I have a lot of things. 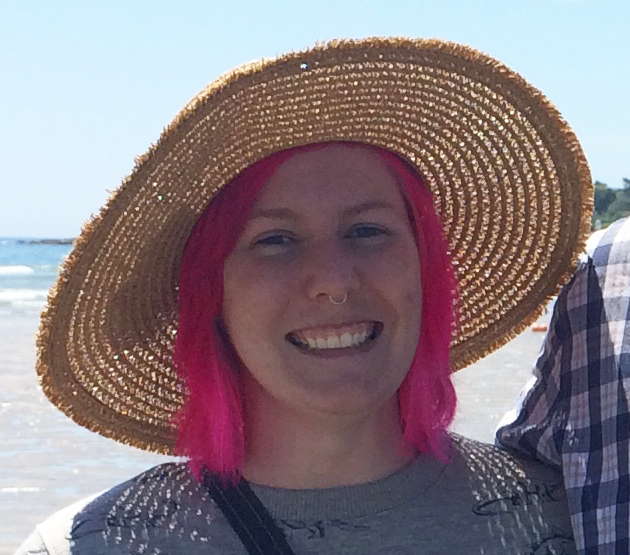 But if I learned nothing else during 4 years of college, at least I learned how to live comfortably out of a tiny room.And it’s very important for me to stay organized because I’m sort of a scatter brain. It doesn’t have to be IN its place, but it does have to HAVE a place. 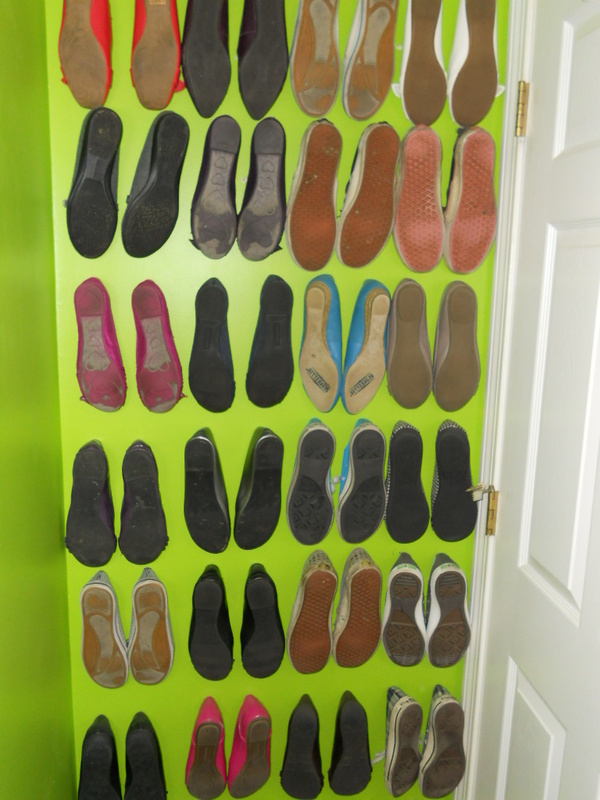 I hang my shoes on the wall behind my door. This way I don’t waste other space storing them, and I can see them well enough to find what I’m looking for in a hurry. It’s ok that they hang the opposite way, I can still see what they are! 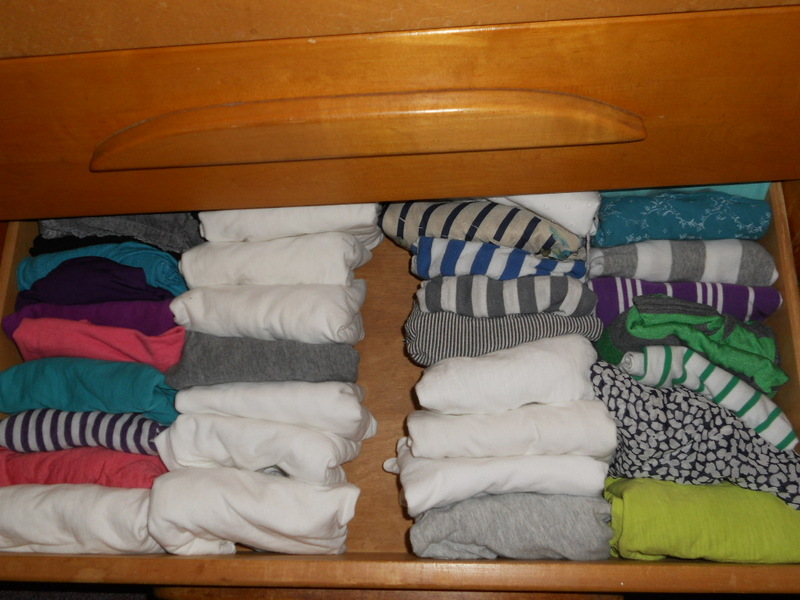 I fold my shirts into squares and then arrange them in columns in my drawers. They take up less space this way and it’s easy to see which are ready for wearing. 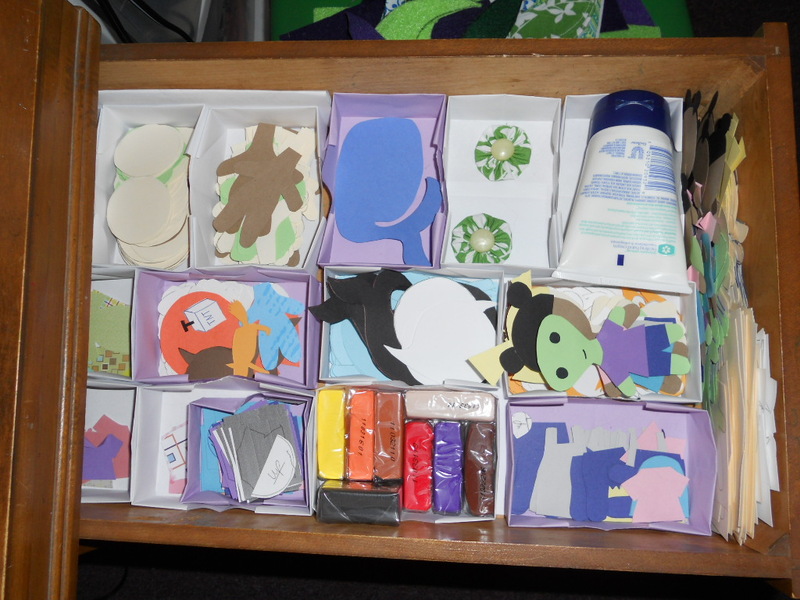 One of my desk drawers is for ready-to-craft projects. If I’m working on a story and need to make some characters I don’t have to waste a lot of time cutting paper. I wasted that time a long time ago! Best off all might be my sewing tackle box. Fishing lures? Naw. All my sewing supplies (except fabric and thread)? Bingo! 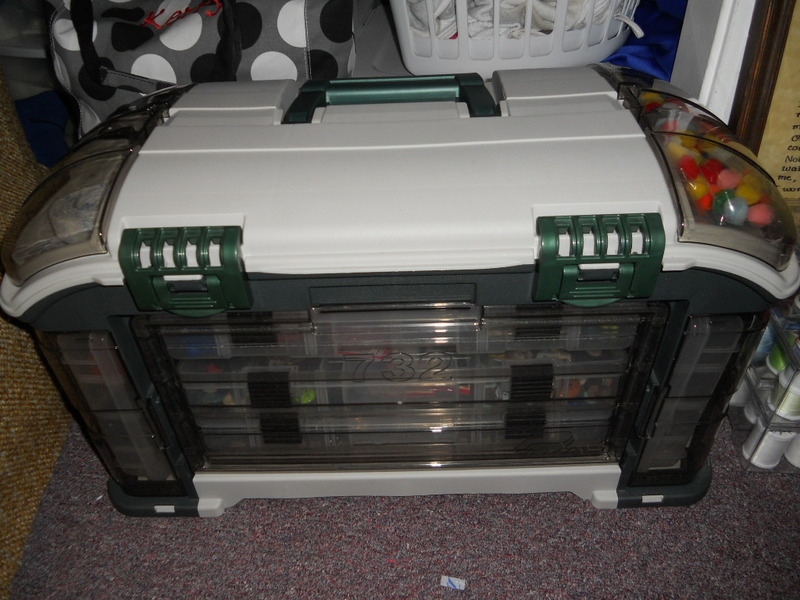 It closes right up and is sturdy enough to stand on when I can’t reach something in my closet! These are just some of the things I do to stay organized. I’m not saying they’re foolproof solutions, but they definitely help get me through the day. 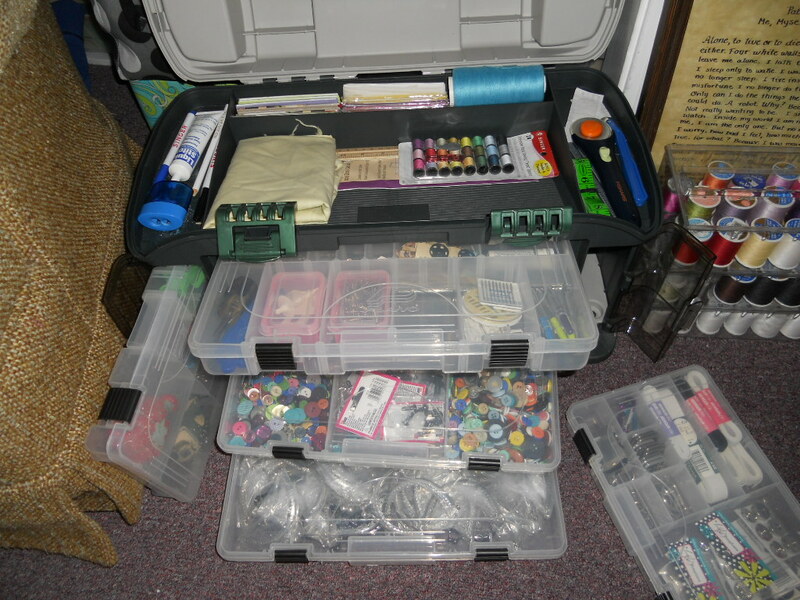 I think I’m going to have to steal your sewing tackle box idea and use it for all my jewelry making supplies, which are currently being stored in a large bag that likes to spill over and make a huge mess every once in a while.